Creamy Vegan Tomato Celery Soup Recipe with Video. A light yet filling soup that can easily make a whole meal in itself. 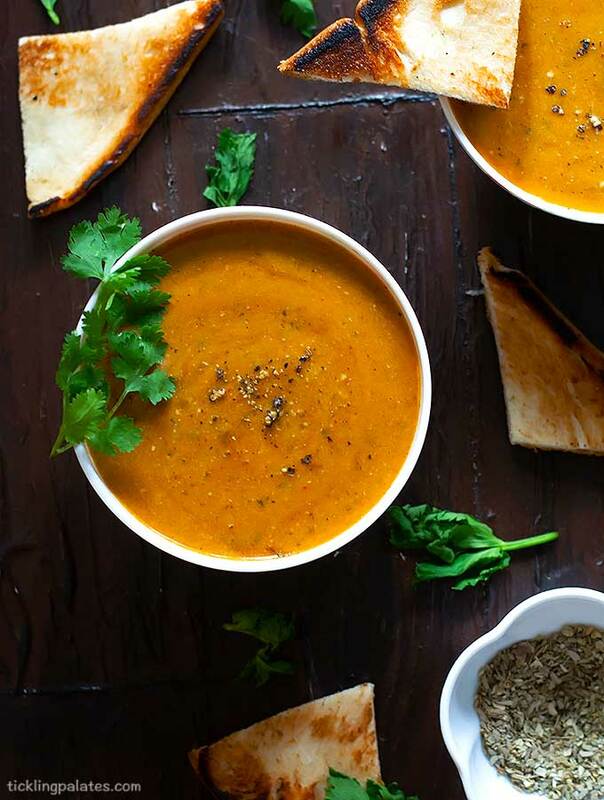 Make this delicious soup in just 15 mins using a pressure cooker which cal also be easily adapted to be made in an Instant Pot. Celery has emerged as the new super food in town & drinking celery juice has become the top weight loss food trends to do the rounds in 2019. 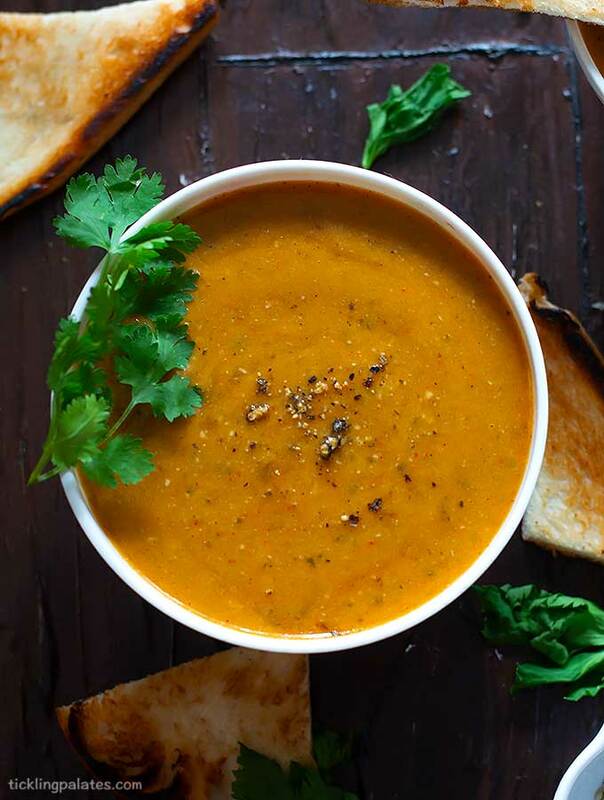 If you are not one who loves to drink celery juice, then you don’t have feel like you have been left behind but instead use it in other recipes like this soup to get its full benefits. I love a good bowl of piping hot tomato soup. In fact its the only soup I remember having during my childhood days as that’s the only thing my mom knew how to make other than mixed veg soup. Though Rasam can be called as a soup representing South India, as it is served with rice and very watery in consistency, we do not take it seriously enough to call it as a ’soup’. Until 2 years ago, soup was very rarely made at home, even then its mostly only during the winter time as the boys would ask for something piping hot. But nowadays, I have to come to appreciate & respect it enough to consider it as an easy, nutritious and wholesome snack or dinner for me. Take for example this creamy vegan tomato celery soup, I make a large batch on Sundays as a part of meal prepping & refrigerate it. I serve it with toasted bread for my kids as a quick evening pick me up after heating it up in the microwave. I mix in some cooked quinoa, which again cooked on Sundays to this soup for some added protein & have it for my dinner. Totally filling & satisfying when I don’t want to cook something for myself. Do take a moment to subscribe to my YouTube Channel for more recipes. 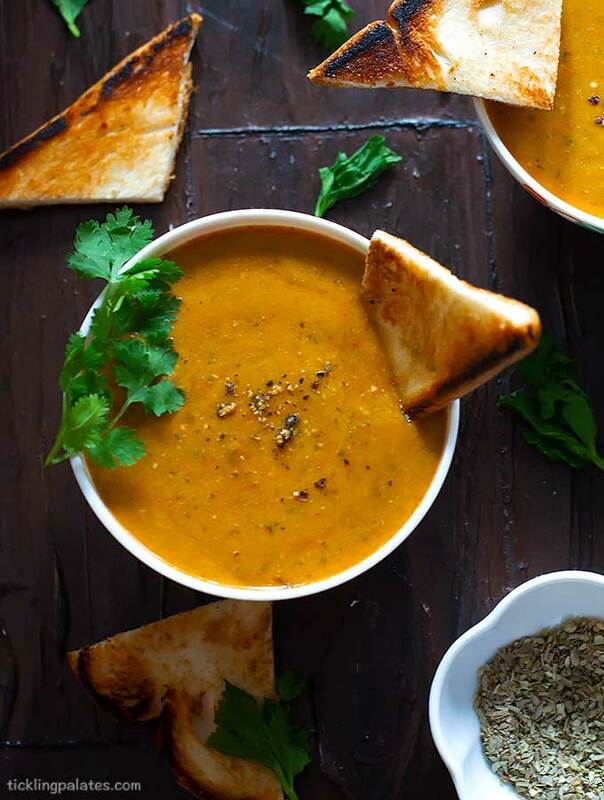 Creamy, Vegan & Gluten Free Tomato Celery Soup that's made in Pressure Cooker in just 15 mins. Heat approx., 2 cups water in a bowl. Remove the eye of the tomatoes and make an X at the bottom using a shark knife. When the water comes to a rolling boil, drop the tomatoes in it. Switch off stove & close the bowl with a lid. Let it sit for 15 to 20 mins. Transfer the tomatoes with a slotted spoon to a plate. Peel the skin off the tomatoes, roughly chop and set aside. Add olive oil, when it gets warm, add sliced onions & saute for 30 secs. Add chopped garlic, celery, cauliflower & mix well. Add tomatoes, cashew nuts and mix again. Add basil, oregano, red chili powder, black pepper powder and give it all a mix. Add vegetable stock, salt, coriander leaves and mix well. Close with the lid and cook for 2 whistles. After the pressure releases, open the lid & blend it all using an immersion blender. If you do not have an immersion blender, wait for it to cool a bit, transfer to a blender & blend well. The consistency of the soup can either be creamy smooth or chunky for some texture. 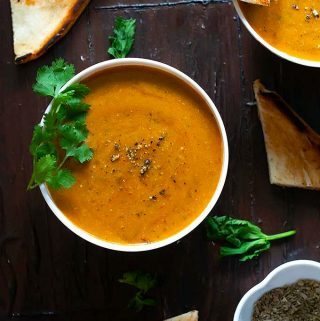 Serve this creamy vegan tomato celery soup in individual bowls. Sprinkle some freshly ground black pepper on top for added heat with toasted bread or crunchy croutons. I have blanched the tomatoes but if you don’t mind the skin, use it as as such.